My work is created using various forms of printmaking (hand-painted monoprints in water-based paints on archival paper), painting and collage. I think my most successful pieces combine simplicity and the Japanese concept of "wabi sabi" (finding beauty in imperfection). In the spring of 2018 I was an artist in residence at La Macina di San Cresci in Tuscany, Italy. And in 2017 I was privileged to spend two weeks making work in France at Chateau Orquevaux. Away from my typical routines, studio and supplies, I was forced to return to the basics of color, form and composition. As a result, I was reminded that one needs very little to create. Each new piece begins with either a sketch or an idea about colors. And it always comes from a direct experience with the real world. My stone-inspired pieces began with a drawing I made of an arrangement of fallen rocks I encountered high up in the Andes of Peru - an act of nature had created a perfect composition. And that fascination has continued with my exploration of the nearby Northern California coast. I am enamored with ideas, objects, stories, and people from the past. I've been very impacted by the Bloomsbury Group - a small circle of artists and writers in London from the early part of the 20th century. They believed in making as much as they could themselves (textiles, furniture, ceramics, fine art, etc.) and valued the gifts of friendship - especially between men and women - which was rare in those days. I was raised in Southern California where both the coast and the desert imprinted their beauty on me at an early age. I am now fortunate to live and have my art studio in the NOPA neighborhood of San Francisco - near Golden Gate Park and a straight shot down my street to Ocean Beach. The dramatic clash of nature (water, hills, constantly changing weather) with urban forms (architecture, the angles of the streets) has a significant influence on my work. In 2004 I co-founded San Francisco’s Lost Art Salon with fellow-artist, Gaetan Caron. The two of us divide our time between running the gallery and working in our own art studios. Prior to the gallery, I had an eleven-year career as the Vice President of Creative Services for the innovative boutique hotel operator, Joie de Vivre Hospitality. 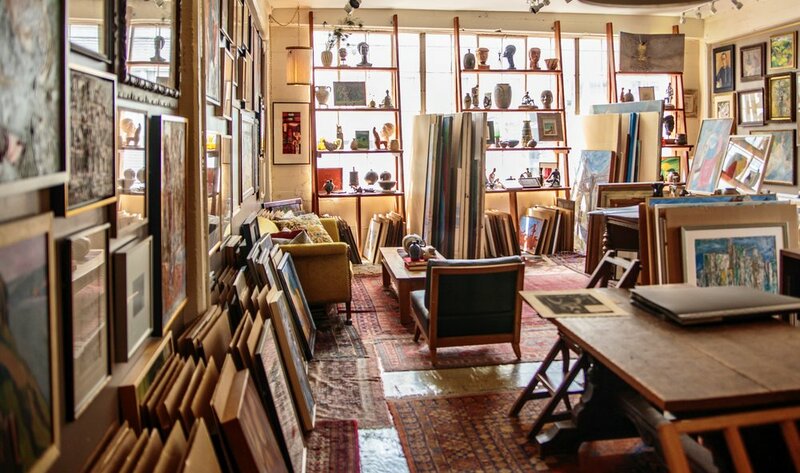 Architectural Digest recently described Lost Art Salon as, “the design world’s secret weapon”, “a gallery like no other”, and “the embodiment of a 20th-century Parisian Salon.” We specialize in the rediscovery of historically significant artists and the curation of fine art collections that reflect the major styles and movements of the Modern Era. We offer over 5,000 original artworks from the late 19th Century through the present day, with a strong emphasis on 20th Century Modernism. In addition, we present our own art in the “Owners Gallery” located on the mezzanine level of the gallery.